Although deliberations were still ongoing, an initial set of reforms - which very much reflected Dupaty's views - was packaged as the Criminal Ordinance of 1st May 1788. This was one of the famous "Six Edicts" thrown out in the lit de justice of 8th May, along with Lamoignon's onslaughts on the prerogatives of the Parlement. The commissioners resigned in protest, and Dupaty himself felt obliged to vote against the edict which represented the culmination of his life's work. Thus was a final opportunity lost and the work of law reform was left to the Revolution to complete. LOUIS, BY THE GRACE OF GOD, KING OF FRANCE AN D NAVARRE; To all those who will see these present Letters, Greetings. The great administrative goals which occupy us have not caused us to lose sight of other improvements to be brought about through our love for our People. Our criminal laws, which form so important a part of public order, particularly merit our attention, since they interest both our humanity and our justice. 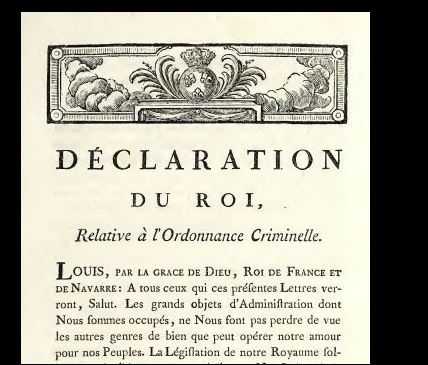 When Louis XIV, of glorious memory, decided to give his Courts the code which today still regulates their judgment in criminal matters, he preceded this memorable act of wisdom with solemn conferences; it was after consultation with the most respected magistrates of the nation that he published his Ordinance of 1670. We shall not conceal that while retaining the greatest number of provisions of the Ordinance of 1670, we could advantageously change several of its principal articles and amend it without abolishing it. 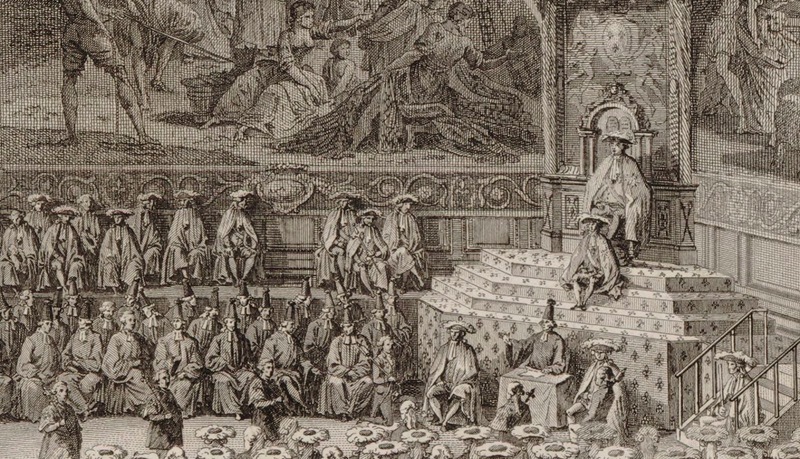 We have taken into consideration that in bringing order out of the chaos of criminal jurisprudence, the Commissaries were not able to provide for every contingency, that the official reports of their conferences bear witness that they were often at variance upon important points, and that their decision did not appear always to sanction the wisest opinions ; that the progress of enlightenment since the drawing up of that Ordinance should be sufficient to induce us to revise its provisions carefully, and to attune them to that public reason, to the level of which we would adjust our laws . . . from the example of the legislators of antiquity, whose wisdom limited the authority of their Code to a period of a hundred years, we have noticed that, this period having now expired, we ought to submit this Criminal Ordinance, which has undergone the judgment of a round century, to a general revision. To undertake this great work with the requisite order and wisdom, we propose to surround ourselves with all the intelligence we can gather around the throne on which divine Providence has placed us. All our subjects shall have the power to take part in the exe- cution of the plan, by addressing to our keeper of the seals such observations and memorials as they deem fitting to enlighten us. We shall thus raise to the rank of laws the results of public opinion, after these shall have been subjected to the test of a mature and deep investigation. This imaginary scene was chosen for display in the exhibition at the which marked the 200th anniversary of the Napoleonic "Code Penal" in 2010 - a reminder of the spirit of benevolence which royal government sought to evoke in its abortive reform of criminal justice in 1788 . The "spirit of system" will always excite our distrust. We wish to avoid all excess in the reform of our criminal laws. This includes excessive clemency, which would be pleasing to indulge if it did not encourage crime by the promise of impunity. Our consistent goals, in the revision of our criminal laws are: to deter crime by the certainty and example of punishment; to make innocence manifest by proper procedures; to make punishment inevitable by removing severe penalties that encourage toleration rather than the denunciation of crime; and to punish wrongdoers with all the moderation that humanity demands and that the interest of society permits to the law. In the interim a few particular abuses singled out for correction. "several abuses which this appeared a moment to remedy":Whilst waiting to achieve fully this useful revolution, we hope to bring our subjects benefit by announcing the abolition of several abuses that can be immediately remedied. The accused will no longer be obliged to surrender their clothes and exterior marks of their estate, merely their arms. Neither our judges nor our courts shall be entitled to pronounce sentence, for the crimes resulting from the action; it is our will that every decree or judgment shall set out and expressly name the crimes and offences of which the accused has been judged and those for which he is convicted. The severest judgment should no longer prevail: a majority of two votes is no longer enough to sustain capital punishment; three are necessary. Lamoignon assures his hearers that this was not merely to prolong the agony of the condemned, but to allow time for appeal: "The king wishes to insure to all condemned persons the time necessary to beg for his mercy and to make sure of his justice. In enlightened countries of Europe all capital sentences are subject to the approval of the sovereign." Execution of the death penalty cannot take place until at least a month after judgment is pronounced, except when there is danger of sedition or riot. The Attorney-General is required to transmit capital sentences to the keeper of the seals. Notice of acquittals must be printed and publically displayed, either at the expense of the private prosecutor or at the expense of the exchequer. "New reflections have convinced us of the deceptiveness and the inconveniences of this kind of proof, which never leads to the discovery of the truth with certainty, usually fruitlessly prolongs the punishment of the condemned, and may more requently mislead our judges than enlighten them". (Declaration). Abolition of all torture, including the question préalable. The question préalable was to be replaced by a final interrogation under oath.